This book is a testimony to the grace of God, the power of His word, and the hope of the Gospel. Dr. Butterfield was a tenured professor at Syracuse University teaching Literature and Women’s Studies. Her research focus was a form of post-structuralist criticism known as Queer Theory. She was in a committed lesbian relationship, was an outspoken supporter of the LGBT agenda, and served as an advisor and mentor to homosexual students. As part of her research on the “Christian Right” she began reading the Bible and conversing with a local pastor who lovingly challenged her presuppositions and stereotypes. By the grace of God, she became a believer in Christ and began the difficult process of having her life transformed. She describes her conversion as a train wreck and the book records the long and ongoing process of her being transformed by the renewing of her mind. The first part of this book, particularly the first chapter, is one of the most compelling things I have read recently. She highlights how the failure of the Christian community to think carefully about the ideas we proclaim and to demonstrate love marginalize those whom we proclaim a desire to reach. Many of Dr. Butterfield’s observations are an indictment against our lack of commitment to open our doors to those who are broken and in need of the Gospel. The implication is perhaps we are content to settle for sloganeering and public positioning because we are content to engage in a discussion about theoretical people rather than in discussions with real people. Homosexuality is obviously a major issue facing the church in our time and Christians are grappling with the appropriate way to engage the culture. Dr. Butterfield, however, reminds us that homosexuality is only a symptom of a more significant issue that Christ calls us to address; namely sin. The good news, as she reminds us, is that God has equipped the Church through His word and the message of the gospel to do precisely that. She emphasizes that most of the helpful progress be at the individual level as local Churches reach out in truth and love, engaging those in the homosexual community as real people rather than projects, and patiently sharing the gospel. Her story is also a powerful reminder that we often do not realize what the people sitting next to us in Church are struggling with or who is not there because they felt too uncomfortable to come. It is a reminder that the first word of the great commission is “go”. It is often not enough just to put an invitation card in a mailbox. We need to be willing to take the message of the Gospel outside of the walls of our meetinghouses. The latter part of the book is a recounting of how significantly her life has changed since her conversion. It covers a number of different topics and includes mild apologetics for adoption, homeschooling, exclusive psalmody, and hospitality. At times, the latter part of the book is a bit like a proud mother rifling through her purse to show you photos of her children. The tone, however, is always sincere and highlights the fact that Dr. Butterfield and her family are real people who are prayerfully continuing on their journey of faith and confidence in Christ. This book really challenged me to ask if my Church and I are really committed to engaging with those that are different and may make us uncomfortable. Are we confident enough in the Gospel to share it with the outcasts and those on the margins of society? I recommend this book, particularly the first chapter, to anyone who may be asking these questions, and especially to those who are not. 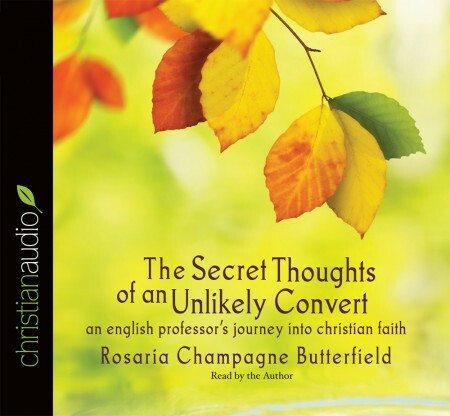 * I received a free copy of this book from christianaudio.com as part of their Reviewers Program. Reviews are not required to be positive and the opinions I have expressed are my own.